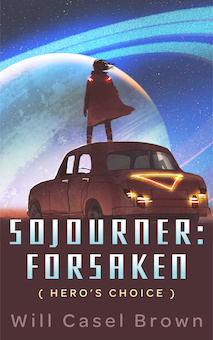 Welcome to Chapter 3 of Sojourner: Forsaken. My Hero’s Choice adventure. 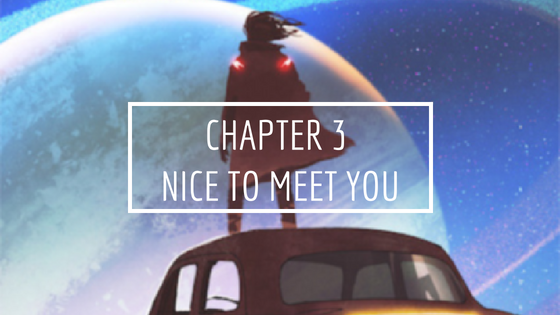 You can find Chapter 2 here or go to the Table of Contents. Please ensure you vote for the next action after you read this week’s chapter! Good luck, Observer! You look toward DC again and think about your pod hovering over the National Mall, unseen. You just have to get there. “Who’s waiting for you,” Kid says. You take a deep breath before you turn to face her. There’s a bit of anger and bitterness bubbling up just under the surface of your appearance. That was the saying they taught you in Observation Survival School. Maintain composure when, if ever, you came in contact with Earthlings. They can be a sensitive lot. “Her name is Jackie,” you say as you turn from DC and begin following the tracks leading away from the city. You don’t hear Kid following at first, but soon after you hear a hobbling step and drag. She catches up after you slow down. She stutter-steps but doesn’t stop. “Where are you from?” she says in a voice quiet enough that you realize that she partially understands. “Pit stop?” you say. Slang and uncommon English were never your strong points though you picked some up in school. You never figured you’d ever really need it. Kid looks at you, and you can see the pieces falling in and out of place at the same time. None of that makes any sense, but you surmise that your uniform stands out. You nod to acknowledge that you understand. The sun is sinking toward the horizon as you begin to open up to her, breaking the rule of maintaining scarcity of knowledge. She stops at a dirt path that leads from the tracks to a slightly wooded lot. Beyond that, you can see several apartment buildings. She gives a good look around in all directions before beckoning you to follow. “Like me?” you say as you step into the brush. There isn’t as much smell or the telltale signs of temporary residence as in the other wooded area. “Kayla, what’s up girl?” The voice startles you and immediately you’re in defensive mode: Fists clenched and instantly aware of every object in your immediate vicinity. You’ve walked into a clearing just before the main road. The area is littered with old mattresses, tire rims, and broken appliances. It probably served as a make-shift dump for the neighborhood. Two young men, older than Kid, but much younger than you, have emerged from a path to the right. Both are well built but slender. Their dark skin in contrast to their white, matching t-shirts. “Dante, Chuck!” Kid says with a smile. She opens her arms and embraces one of them. The other doesn’t take his eyes off of you. “Who’s this?” he says taking a drag off of his cigarette. Both of them are looking you up and down. You turn to look at her. No one, but Jackie has ever called you that, but you maintain. She gives you a wink, so you go with it. “Nice to meet you,” you say extending your hand. They look at you, then each other and laugh. The man who gave Kid–Kayla– a hug, stands tall then firmly grips your hand and bows. Chuck breaks out in a laugh between drags of his cigarette. “You crazy, man.” He collects himself with another drag then looks over to Kayla. You smile at her. She reminds you of the fire you used to have before your training on ProtoTerra. Dante and Chuck reach for the pockets as a warbling tone sounds from something inside them. There’s a ding from Kayla’s watch. She looks at it as they pull phones out of their pockets. Kayla gasps as she reads something. “Kayla?” Dante says as he turns his phone towards her. You lean in to get a look. Under the heading is a clear image of you and Kayla from the alley. You are delivering a blow to Sergeant Elias while Kayla is standing over the bloodied body of one of the others. Kayla is visibly shaking. Her mouth struggles to form words. You take her by the shoulders and look her in the eyes. There’s a click behind you, and you feel metal pressed into the back of your head. You think about taking him out, but you hold on. Something in your conscious says to wait. Everyone turns to look at once. And at once everyone, including you, takes a step back. Back-lit by the deep orange sunset sky is The Enforcer, Cornelius Bartholomew. His golden buzz-cut stands out against his black combat uniform. The air around you swirls as he descends. The temperature drops ten degrees in a split second. Chuck turns his gun to Cornelius. The end comes quickly for Chuck. A single power blast from The Enforcer’s fist blows away the weapon and the attached arm past the shoulder socket. Chuck’s body pirouettes as he flies backward into a tree where he crumples to the ground. Dante runs over to him and falls to his knees beside him. You put up your hands toward Cornelius and the air crackles as a bright blue shield arcs between you. “You killed him!” Kayla rages. “You murdered him!” She steps up beside you. “Stay back, Kayla,” you say keeping your eyes fixed on Cornelius. You’ve seen what he can do in battle. “Leave us, Enforcer,” you say with more confidence than you feel. He turns his attention to Kayla. She gasps and her knees buckle. This makes him laugh. You think quickly about your choices. You could try an all-out attack on Cornelius, who though he stands two feet taller and almost double your weight but is slow when it comes to hand-to-hand combat—your specialty. You could use your powers to use the junk around you to hit him from multiple-angles which could provide enough of a distraction for Kayla and Dante to get away and possibly save her family. Or, you could lower your shield and turn yourself in. You would employ the negotiating skills you were taught on ProtoTerra. You’d give as little information as possible but open up communication to perhaps build an amicable connection. You've been found by The Enforcer. What do you do? Be one of the first to read the next chapter! Want to get notified as soon as the next chapter is published? Plus, get links to read on your preferred reading device. Join the Hero's Choice list!